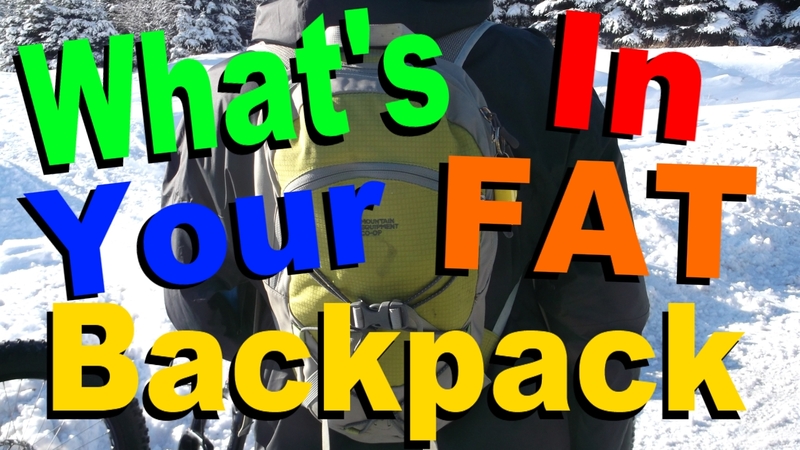 What's in your FAT Backpack? 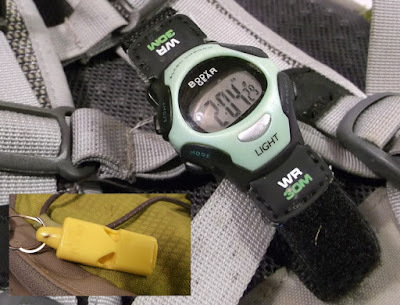 I have ridden with folks that take nothing but an allen key and a bottle of water, while others could rebuild their bike with spare parts on the trail in the dark. I try to keep my backpack towards the lighter end of the spectrum. I carry the vast majority of my tools in this inexpensive two compartment pencil case. As this is the heaviest item it lays on the bottom of my fatpack. The case is jam packed full of items that I would need to get me (or a buddy) back on the trail if something should go wrong. 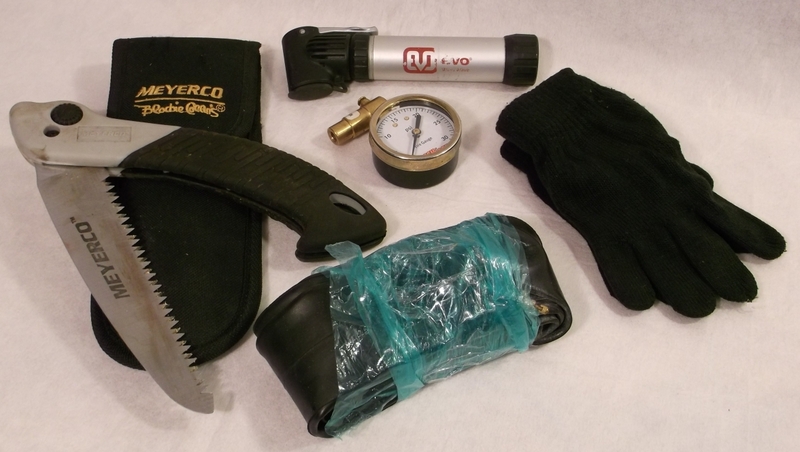 I also carry a small high volume pump, tire gauge, tube and a pair of stretchy gloves. The folding saw gets added if I'm riding after a large wind storm or if I'm riding in unfamiliar wooded terrain. Its always good to bring along food in case you or a buddy get low on fuel. Taste of Nature and Clif bars are my favorite, with a few boxes of raisins for a quick boost of energy. A fatpack would not be complete without a few medical supplies. 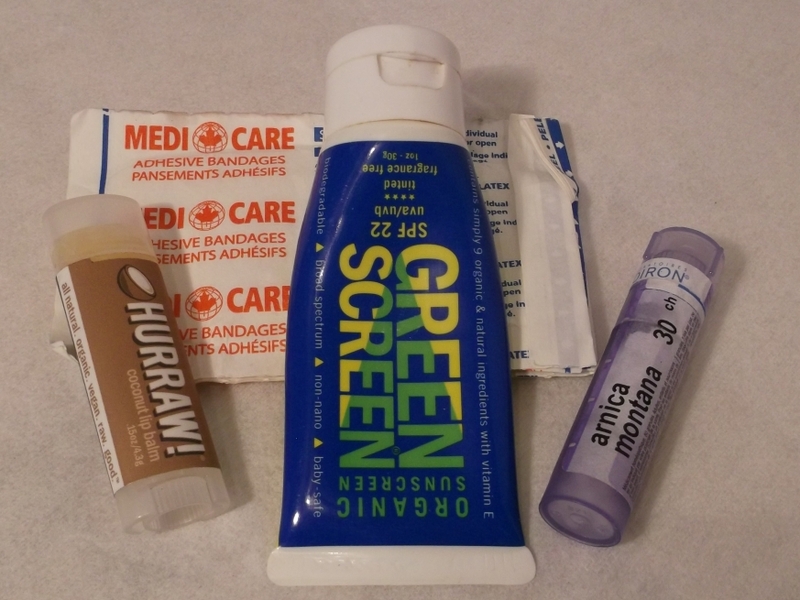 A couple of large band-aids, lip balm (mostly for winter), sun screen (mostly for summer) and arnica (homeopathic used for impact injuries). 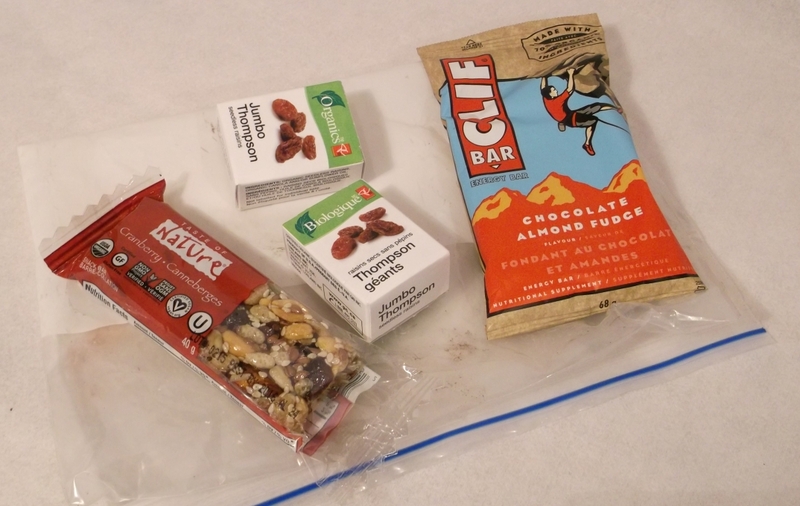 The food and medical supplies are in double plastic ziplock type bags to keep it dry. I also squirrel away a $5 bill in case a convenience store stop is needed. And finally, attached to the outside of the pack, is a waterproof watch and Fox 40 whistle. Although additional things do creep in from time to time, based on the excursion, I feel the above items are the bare necessities for my fatbike adventures. I bought last week at COSTCO, a Reebok (camel back)backpack. It is not too big, lots of room plus 2L of good fresh water. (need it soooo much). There is room for pretty much all you have here on your list. That is only me though, for I do need a large amount of water. The backpack was retailing for $29.99 and came in 3 bright colors. Red, Yellow, or Blue. I really like it. Then again, it is not the right backpack for camping, or 3 days ride !!! But it is very convenient.